Koala Clancy is one very special koala. He is wild and famous and lives in a natural koala community in the You Yangs just near Melbourne. But being famous didn't protect Clancy from climate change - in early November he was rushed into koala hospital for a life-threatening injury. He recovered well, and was released on 27th November. But his capture was traumatic and difficult, his veterinary needs expensive, and his housing didn't fit his needs and we realised we need a 'safety net' for Clancy, his kids and his wild koala community. 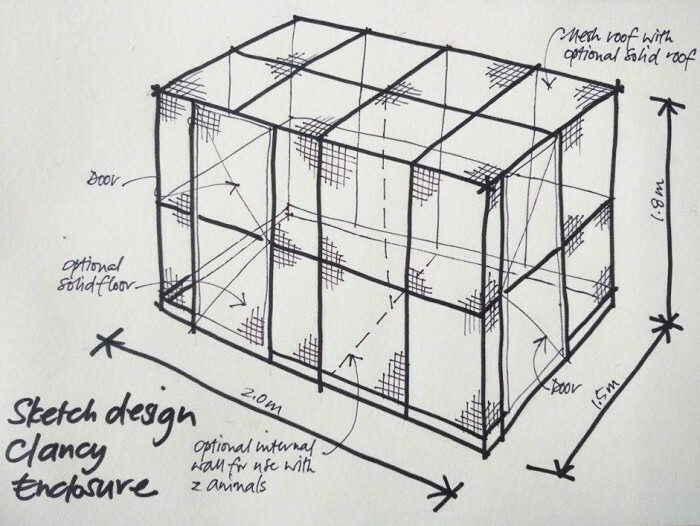 The Clancy Safety Net is a plan: veterinary services, equipment and housing that will make future koala rehabilitation easier. 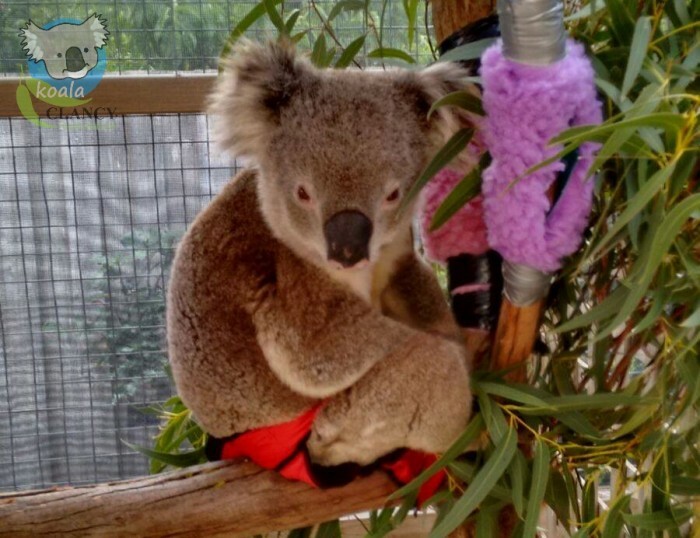 Please donate to the Koala Clancy Foundation to build a Safety Net for Clancy! if there is extra it will go straight to the Koala Clancy Foundation earmarked for tree planting projects in the rivers and creeks around the You Yangs, so that Clancy's kids have somewhere to go in heatwaves and droughts. This part of the project is really important - we will be able to start using these funds as soon as the heat of summer is over (March/April 2016). Who is Koala Clancy and why is he important? 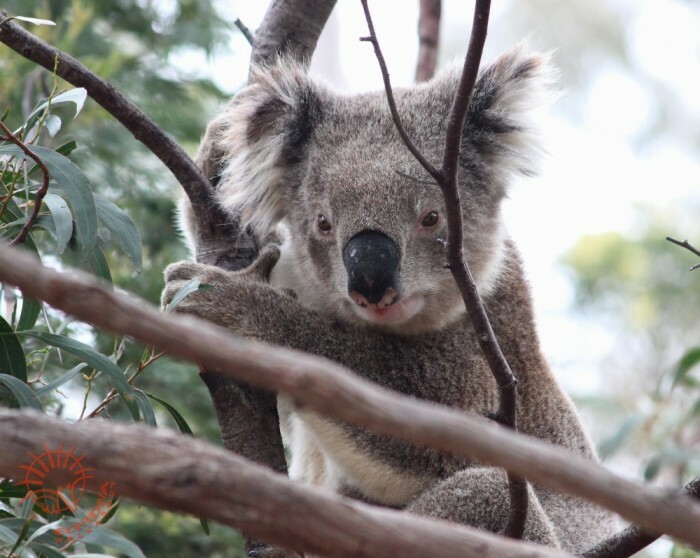 Koala Clancy is an international tourism asset – his face has graced the covers of travel brochures worldwide, appeared on TV, in newspapers and magazines, been talked about at international wildlife, tourism and scientific conferences. He & his family have entertained international celebrities including Gene Simmons, Ray Mears, Jack Hanna, Davey Wavey and local identities Catriona Rowntree, Sorell Wilby and ABC news presenter Del Irani. He is a voice from the wild, speaking up for koala conservation. Clancy is the first wild You Yangs male koala to be monitored from birth to maturity. If he breeds, we will have four generations of his successful wild family documented. Its a Koala Dynasty! With wild animals, it can all go wrong...so quickly. On 26th October 2015 Wildlife Guide Kirby noticed that Clancy was repeatedly scratching at one spot on his lower back. Over the next two weeks a shocking injury became apparent – an open wound 3cm across had become infested with maggots. The pain and itch was so terrible that Clancy couldn't eat, couldn't rest. He was losing weight before our eyes. Worse, in desperation he was clawing at the wound, which was turning his whole lower back into a festering sore. In wild animals, infection can kill. Even if the wound heals over, the infection often continues under the skin and into the bones. There is no treatment if it gets to that stage. On 5th November he was found by Koala Researcher Melinda, who stayed with him until help could arrive. Seven hours later he was caught and rushed into emergency treatment at Corio Veterinary Hospital. It took three of us to catch him – he was angry, in pain and full of testosterone due to breeding season. A pole syringe (a long pole with a syringe at the end) for on-site sedation would have calmed Clancy, and would have saved one of us from a nasty bite. Luckily for Clancy we got him soon enough. Infection had begun under the skin, but was shallow and able to be treated with antibiotics. He was put into intensive care with a routine of regular dressing changes and wound cleaning. He started to recover quickly and gain weight. Cheeky Clancy kept removing his dressing with his sharp claws and dextrous hands, so carer Donna found a creative way of keeping the bandages on! She fashioned a pair of red 'hot pants' for Clancy, with a firm velcro closure, and to our amazement he kept them on! He looked very cute in his hot pants and his Facebook fans went wild. We knew this was a once in a lifetime opportunity to assess a young healthy male who could become the father of many generations. We planned to do a full health screen as soon as Clancy was out of intensive care – blood tests, liver and kidney function, mouth, gums and teeth assessment - and take DNA samples so that one day we could prove his paternity. But Clancy had other ideas. By 27th November (just days of coming out of intensive care) he was feeling so healthy that he wanted to go home – badly. He started to pace, and climb the walls of the enclosure. Wild koalas can stress themselves to death in captivity, and he was starting to show signs of serious anxiety. 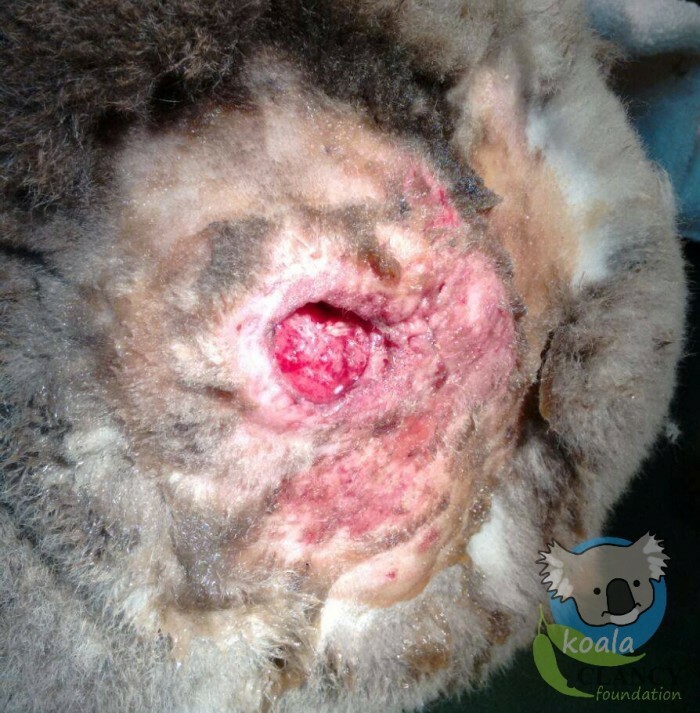 Top koala experts were consulted and decided that he needed to go home urgently. It was late Friday morning – if the vet couldn't do the health screen that day he would have to wait until Monday. The experts didn't think he could wait another three days, so the reluctant decision was made to release him that day, vet check or no vet check. Frantic phone calls ensued and luckily for us, Dr Harley scheduled an emergency full health screen and DNA collection for Clancy within an hour. All systems go! Clancy's return home was magnificent! I opened his basket and after a moment Clancy climbed the nearest tree confidently, then stopped 3 metres up and turned down to look at us. He looked me full in the eyes for several minutes, then turned to stare at Roger in a similar way, all the while breathing deeply through flaring nostrils, smelling us. At the time of writing Clancy has been seen five times since his release and he is behaving normally. Is Koala Clancy safe now? Yes, for the moment. We hope we never have to rescue Clancy again, but with climate change degrading koala habitat and changing the chemistry of eucalyptus leaves, every koala needs more trees to survive. Koalas are being forced to use larger home ranges, which means taking range from their neighbours – which leads to fights that cause wounds like Clancy's. Please support our campaign to raise funds to buy equipment and housing that will make future koala rescues easier. Clancy and his wild koala community are going to need our help - we want to be ready. As outlined in the Budget above, $500 will go to the wonderful vets at Corio Vet Hospital, $200 will buy a pole syringe and around $2000 will be given to Donna's Wildlife Hospital for the new enclosure. It may cost more, so if we receive more than our target we will spend it on that. If there is still extra, it will go to The Koala Clancy Foundation to be spent on creating new habitat for Clancy's kids on private land around the You Yangs. The foundation was set up by Janine Duffy and Roger Smith, owners of Echidna Walkabout Nature Tours - a social enterprise - in response to a decline in wild koalas in the You Yangs where they run internationally-awarded wildlife tours. Janine started the Wild Koala Research Project for Echidna Walkabout in 1998, and the team has been monitoring wild koalas in the You Yangs and Brisbane Ranges National Parks for 17 years. Postage within Australia or overseas is included. Wear Koala Clancy with pride! A gorgeous Koala Clancy Foundation Tshirt available printed either on the back or front, in a range of colours and styles for men, women or children. The shirts are made by RedBubble on sweatshop-free, ethically sourced 100% cotton (except a few colours & styles). You will receive a voucher to cover the cost of the shirt, which you can choose for yourself online and have posted directly to your address. 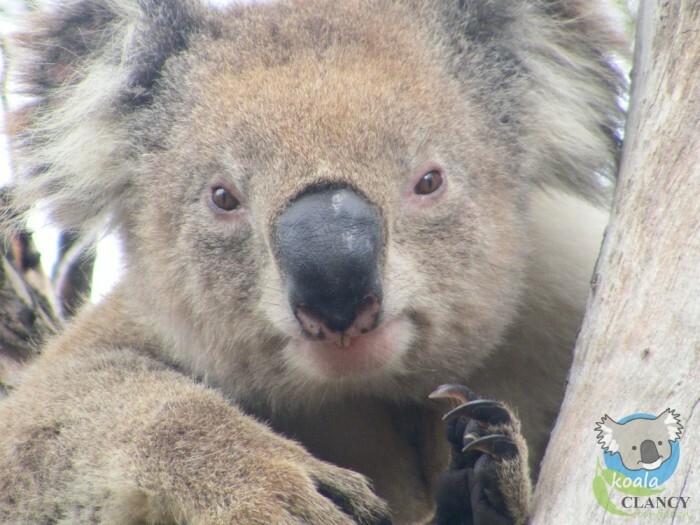 Be a VIP at the Koala Clancy Foundation launch: Join a fun gathering of koala conservationists, responsible travel professionals, naturalists, long-term supporters of Koala Clancy and media at the party of the year! Light food and drinks and entertainment will be provided. The party will be scheduled for early May 2016 - around the time of Clancy's birthday. Also included is a big shout-out on our social media channels, and a signed Koala Clancy of the You Yangs book. Meet Koala Clancy himself! Because he is a wild animal, this perk is subject to a number of factors - Clancy staying alive and within his current home range; your availability and location; and luck! We go out finding koalas around Clancy's home area four days every week, and we usually see him on average 3 times per month. To give you the very best chance of seeing him, we would ask for your availability (days per week) and we could text you if he was found by our researchers in the morning of a day that you are available. You could then decide if you wish to go out, meet one of us who will take you in to meet Clancy. If this doesn't work out for you, we will be happy to offer you a private Koala Conservation Day for you and up to ten of your friends on a day of your choosing. Can we protect wild koalas from climate change? Yes, we can try - we have a plan and we need your help! $40 Take home a Koala Clancy of your own! 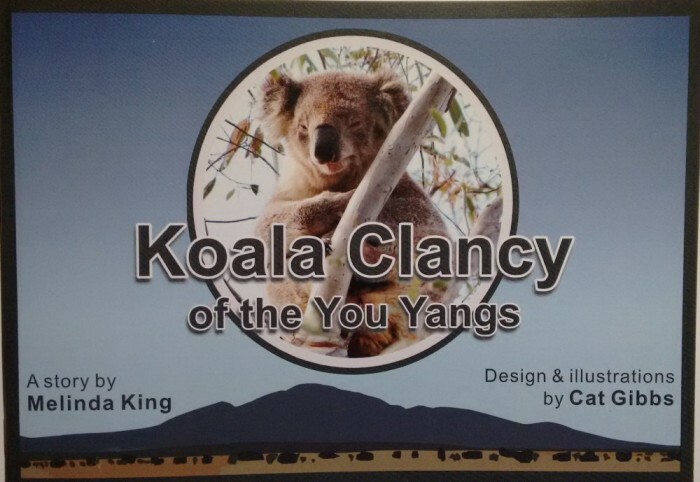 Fun, educational - the book "Koala Clancy of the You Yangs" is suitable for all ages, but especially for kids 6 to 10. This special book is signed by the author - Wathaurong Aboriginal woman and Koala Researcher Melinda King. Two tickets to the official launch party of the Koala Clancy Foundation in May 2016. Meet other incredible people who love and protect koalas! $50 Wear Koala Clancy with pride! A visit to the You Yangs to meet Koala Clancy in the flesh. Note: he is a wild animal and is unpredictable so we can't promise exact dates or times, and it may take three or four tries before we can make this happen. This perk is best for those who live in the Melbourne/Geelong region and have regular availability with an hour's notice. Please see full description on the main page before selecting this perk. Est. Delivery Date: anytime after January 2016 depending on your availability and Clancy's! * $215 in offline donations included in total.